Good morning, BB addicts! Happy Monday & Happy Veto Ceremony day! Today we will see veto winner Amanda pull McCrae off the block & then Elissa will have to replace McCrae with another houseguest on the chopping block. So, who will it be? It looks like it'll be Andy. As it looks right now, if it's Andy/Aaryn on the block, then Aaryn will most likely be going home. But we're still a long ways away from Thursday and anything can happen. The only vote that nobody (including us live feed watchers) knows how they will vote, is GinaMarie. Also, it appears that Andy is not on Team Elissa after all. 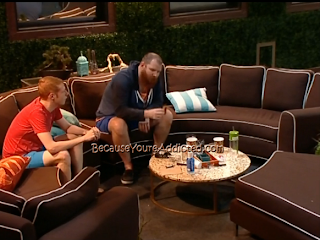 Spencer/Andy talked last night and Andy mentioned that he wants Elissa gone next week. (I'll cover that in the Overnighter). So does Amanda and McCrae, obviously. Last night, I posted that the feeds were on trivia and when they came back on, nothing seemingly happened. Not too long afterwards, Amanda was heard talking about how production asked her to stop her antics (though she wasn't breaking any rules and didn't have to stop) and told her to not make Elissa feel "threatened" in any way. So she read the BB rule book for awhile last night and stopped her antics. **You can watch everything posted below on the Flashback Feeds, which comes with your live feeds $10/month feed pass! 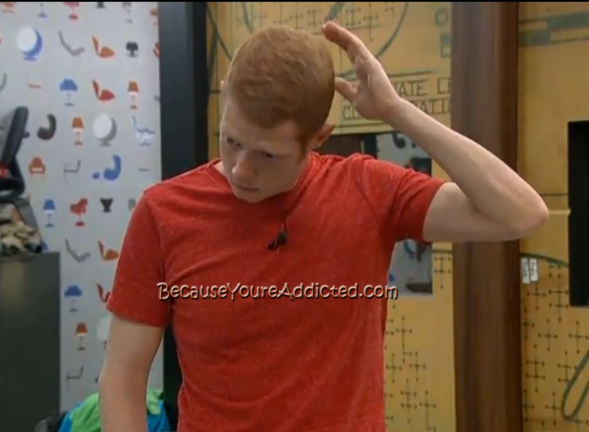 Andy: "This is gonna make me sound like a flip-flopper, but if I win HOH next week, I'm gonna put up Elissa and Judd." They agree that even though McCrae/Amanda "need to be split up", Elissa is really scary to them because she's unpredictable..while Amanda/McCrae are predictable. Spencer: "Aaryn's gotta go this week. Elissa next week. Then split up Amanda & McCrae. Then Judd, GinaMarie. Me and you." Andy: "Yep. And maybe we could go to McCrae and say we wanna work with you but we need to break you (and Amanda) up...or we could cut McCrae and leave Amanda (in the game) heartbroken." McCrae/Amanda are talking as Amanda is reading the BB rule book. Amanda: "What are you thinking, poopy face?" Amanda: "Yea, THREE nominations! She got to nominate 3 people." Amanda then talked about how Elissa was set on putting up GM and then Judd/Elissa talked and now she wants to put up Andy. Andy: "She said there's no way she could vote (Aaryn out) and you can verify this. She said 'Well I'll probably do what Elissa wants but I would need to talk to Aaryn and figure out what's best for my game..' , that's exactly what she said." Spencer: "That's what she said." Andy: "And I said "I'll vote to keep you (if you're on the block)' and she couldn't say the same back to me. And I'm telling you, you have 3 people right here (Judd/Spencer/Andy) that will not screw you over. We'll all vote to keep GinaMarie over Aaryn." Elissa: "So, can we say that in front of GinaMarie?" Andy: "I mean yea, we could but like, I feel like that's gonna cause some trouble." Spencer: "I mean, that's what she said. I don't wanna cause a big fight." Elissa: "We were just talking.."
Andy: "We were just saying, if I went up, and if it's what Elissa wanted, would you for sure vote to keep me?" GM: "I told her upstairs, I personally said I would. Elissa: "That's all you have to say...you shouldn't have to explain yourself." GM: "I've doing what the HOH wants from week 1." GM starts on a rant about how Aaryn is hanging out with Amanda all the time and she doesn't know what to believe anymore. Andy tells Amanda/Aaryn that he is "100%" going up and that GM will vote him out. Aaryn/GM talk in the bathroom. GM tells Aaryn what she just said in the backyard to Andy/Spencer/Judd. GM: "Why would they ever think that I'd vote you out! They're f**king crazy! You're my BB bunny, forever!" Aaryn tells McCrae/Andy/Spencer/Judd that GM is definitely "100%" would not vote Aaryn out, despite what Elissa thinks or what GM tells Elissa. Aaryn: "How could Elissa believe (that GM would vote me out)?" A minute later, Aaryn goes back inside. What Aaryn told the boys about how GM would never vote her out, has Andy worried. He's been freaking out ever since. Andy is saying that he wanted Elissa to go last week but then she won the veto because "Amanda lit a fire under her a**". Andy said that Elissa wasn't on his radar but if he goes up as the renom, then she will be. Andy/Amanda talk about letting Judd know tomorrow after the Veto Ceremony that this was all an act & a plan before Aaryn can tell him. Andy thinks they should tell Judd that Aaryn was in on the plan. too. Andy: "..because if (Judd) thinks we're all working together, then he might get rid of me. But I feel like Elissa wants Aaryn out so bad that that's (who Judd would vote to evict)." Amanda: "Does Elissa know that if she puts you up, that you'll be coming after her?" Andy: "No. But I will! 100%!" Amanda: "How does she not think that?" Andy: "I have no idea. I'm gonna make it clear to her tomorrow." Amanda: "Tell her that if she puts you up, that you'll put her up next week and make sure she'll go home." Andy: "We'll talk tomorrow morning. Pull Judd aside after the veto meeting." GM is pissed because Aaryn/Amanda were laughing so loud that it woke her up. She starts bashing Aaryn (a lot!) and says she won't have any problems voting Aaryn out. (*We'll see.) She said that she's negative and not treating her like a friend, makes fun of her for still liking Nick, etc. **Tha'ts pretty much it for the Overnighter! There was yet another alliance formed last night that I'm sure will last all but 1 day lol...this one is called "The Exterminators" and it includes Andy/Spencer/GM/Judd. We'll see how long it last for. (I swear these HG's just create new alliances out of boredom. lol) Oy vey. Judd needs to win HOH next week and put up McCranda. Then if one of them wins veto put up Andy/Aaryn (whoever doesn't leave this week) as the renom. What is the story behind Amanda's pregnancy? I must have missed that on the feeds but I see people talking about it in the chat rooms. Does anyone know? I KNOW that production interferes with the game but it still kind of annoys me when we find out about it. Houseguests have used "psychological warfare" in the past and production hasn't done a thing. But when it is happening to their golden girl Elissa, they basically make Amanda stop even though she isn't breaking any rules. Kinda knew Andy and Spencer could not be trusted. Please send andy packing, beside being the gossiper and instigator of the house he is the one who has really stabbed everyone in the back and kissed booty the most. When Elissa first came into the house she was at a huge disadvantage with the other HGs. I can see that production would allow Rachael's fans to vote her MVP in the interest of fairness. If they had not done that, she would have gone home in the first few weeks. She has had a chance to prove herself and come out on her own, as her own person and distance herself from her witch of a sister. She had failed to do so. She is every bit as much a witch as Rachael was, if not worse. Production should no longer being playing favorites with her. When she looks at herself in the mirror, which she does constantly, she doesn't see the vile person that she is. I love how Elissa is telling Andy that he's pretty much overreacting to be put on the block. Then he tries to pull out the loyalty card which Elissa didn't buy at all.... seeing how he voted out HELEN. Andy no one thinks your stupid but we don't think you're that smart either...everyone knows that you're aligned with MC& Amanda. I can't wait for him to let all the cats out of the bag. KimM: Thank you. I've been trying to say that. Psychological warfare is FAIR GAME in Big Brother and has been practiced many, many seasons. It's only when Elissa is the target that they try to make it stop. I call BS. Enough is enough with the blatant Elissa favoritism. Elissa could have made a nice place for herself in the house, but "those people" aren't "good enough" for her. Elissa could have done so much better in the house but it seems like her heart just isn't in playing hard. i like how amanda needs to read the BB rule book to know how far she can go without getting in trouble. that should be a wake up call to her that she is out of control with her harassment. It might be because if someone feels truly threatened ( which is considered assault... you don't have to touch for it to be assault) they can bring it up. Remember she tag the rule book and tone it down. She continues to yell at her and call her out but she's robbed it down.